2018 Shakespeare Awards 2018 – Lifetime Achievement Award Winner, Molly McQuoid with Emma Ditnes, Liz Fredette, and John Rea. MacGuffin’s annual Shakespeare Awards celebrate acting achievements from our most recent year. Nominations are announced in December. The awards are hand-made by Taylor-Backes glass blowers in Boyertown, PA. The formal ceremony includes video presentations and live performances. We also have former Shakespeare Awards winners, instructors, staff, and alumni to help us present the awards. 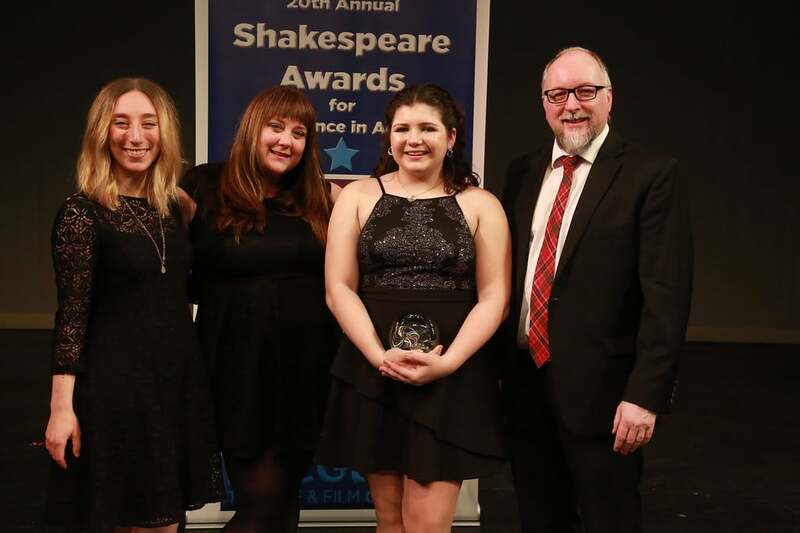 Our 20th Annual Shakespeare Awards ceremony will take place on Saturday, January 12, 2019 at 7 PM in the Kurtz Center for the Performing Arts at William Penn Charter School. The event is formal. MacGuffin students, families, and friends are welcome to attend.